Sunrise in Bagan, Myanmar. Just another day in the travel lifestyle. Trying to stay awake on the way to Bagan after the nightbus from Mandalay. The sunrise journey began at 4am. We sorted a bed for the night on arrival in Bagan after the night bus from Mandalay and myself and fellow bus passenger Il Goo (from South Korea) roomed together and shared a horse and cart together as we headed for sunrise. We couldn’t get into our room until after breakfast so to make the most of it, we just did sunrise on our first day in Bagan. 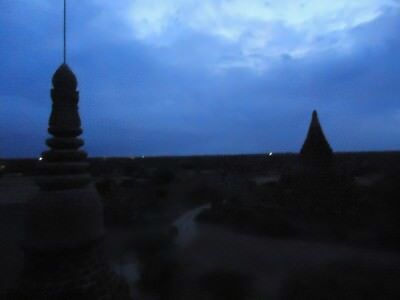 Early morning in Bagan awaiting the sunrise. The horse guys were real rip off merchants so be careful. I’ll be honest and admit I even thought paying them 1,000 Kyat to get there for sunrise was a rip off and that was my first bid. They hit us back with 10,000 Kyat! I couldn’t believe it. We eventually got it down to 3,000 Kyat each and basically used the driver to get there and back and wouldn’t want to talk to him or ever recommend using him again. Why didn’t we get bikes? Because we had just arrived off the bus and it was dark, we were tired and we weren’t sure where to go. (We hired bikes later in the day). The sun starts to come up over the temples of Bagan. We head to the Buledi Pagoda and it’s pitch black. So dark – we all need to use our headlights and torches to climb up to the top. We wait for about 1.5 hours there just chatting. Be aware of horse and cart rip off buck eejits! Then the sun comes up. 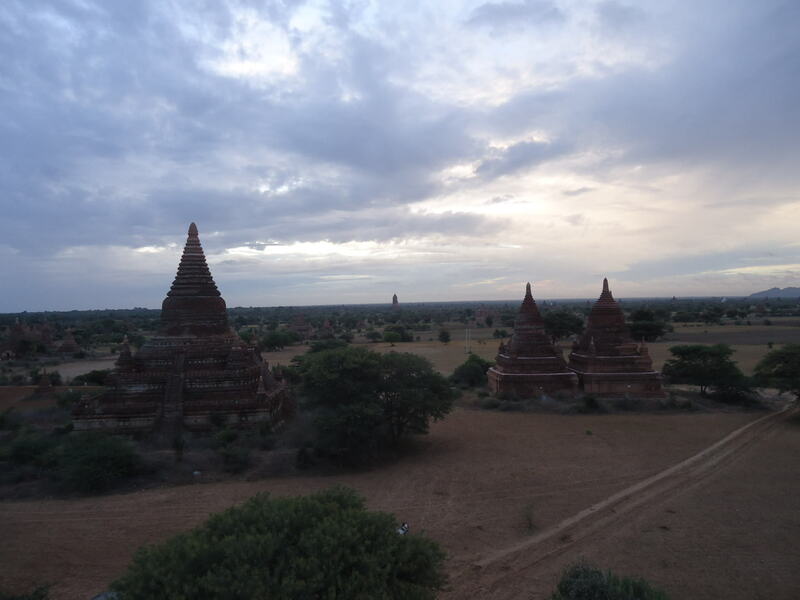 A panoramic shot of sunrise at Bagan, Myanmar. And that’s it. Nothing inspiring, nothing really mega to write home about (hence the shortness of this post). 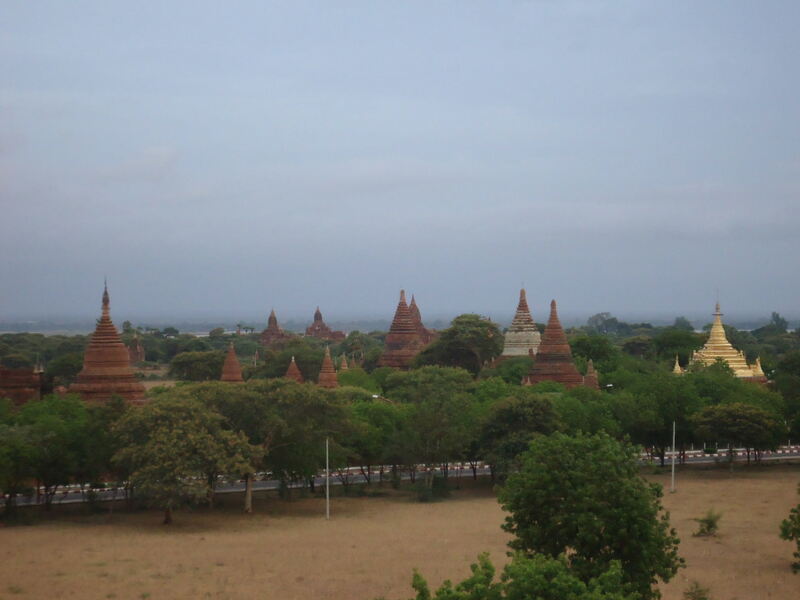 View from the Buledi temple in Bagan, post sunrise. It’s just a load of scattered temples and pagodas in the middle of obscure countryisde in Myanmar. 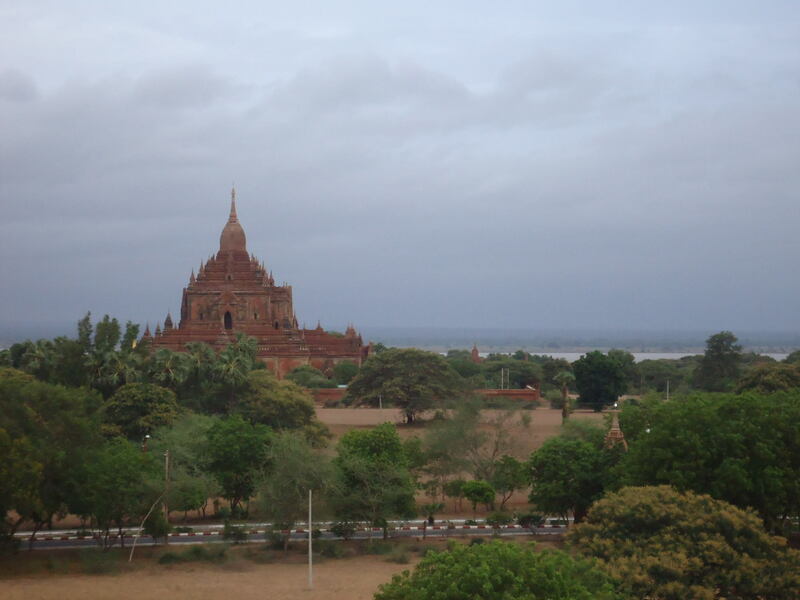 Bagan is just a load of scattered temples – not all it’s cracked up to be. I ended up heading on a bicycle to a load more of the temples that day and later watched the sunset from the Buledi Pagoda again. 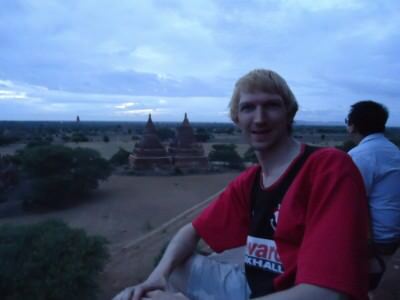 You don’t need me to tell you how disappointing Bagan is. It was hyped up and I expected to really love, but I just wasn’t taken by it – a mildly average place. Perhaps I picked the wrong time, saw the wrong sunsets and visited the wrong temples. I met tons of people who raved about Bagan. This entry was posted in Asia, Bagan, Destinations, Myanmar. Bookmark the permalink. 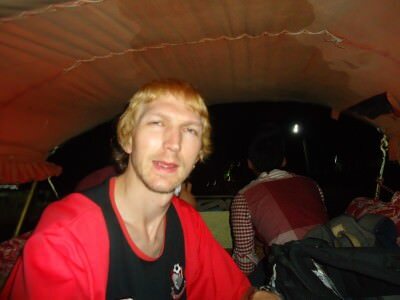 Jonny you do look a little wrung out in the bus photo but what an amazing landscape you experienced. Wow! I see the sunrise and the balloon there too. When you go there? The balloon not there?